You've read one TOi article. You've read 15 TOi articles. You've read every single TOi article. You've read a single TIPS. You've read every single one of the TIPS. You've played all songs in Music. Reach a dead end without accessing TOi once. You've read the profile of every character. You've seen all of the summaries (yup, all 110). 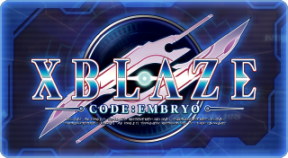 You've started your journey into the XBLAZE universe. Completed all scenarios 100%! Good job! It's Not Soylent Green. Stop Asking. Experienced the hilarity of the gag scenario. Clared Episode 2 "Unforgivable Sin"
Cleared Episode 3 "10 Sages"
Cleared Episode 5 "Desired World"
Cleared Episode 6 "A Stranger"
Cleared Episode 7 "Irreconcilable Differences"
Cleared Episode 8 "Demon's Roar"
Cleared Episode 7 "Courting Catastrophe"